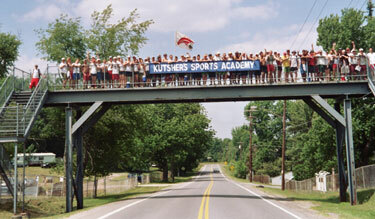 This picture was taken at the 2005 Crossmen spring training site, Kutsher's Sports Academy in Monticello, N.Y. Kutsher's is layed out in a strange way, in that the cafeteria and dormitories are on one side of a road, and the practice fields are on another. To keep people safe crossing the road, they built this tall pedestrian bridge for people to move from side to side. We weren't allowed to cross the road without using the bridge, so basically, six to seven times a day we all climbed this bridge to get from one side to the other. Not so fun after a full day of rehearsal. One day, we got the whole horn line up on the bridge and our baritone tech Aaron Goldberg bravely risked his life--standing in the middle of the road--to capture this once in a lifetime picture! The hornline flag is in the middle of the bridge, and the breeze caught it just the right way!